HELL'S KITCHEN — It's an oasis in the urban desert — a tiny patch of green surrounded by plants, covered in chairs, and bordered on all sides by some of New York's worst traffic. 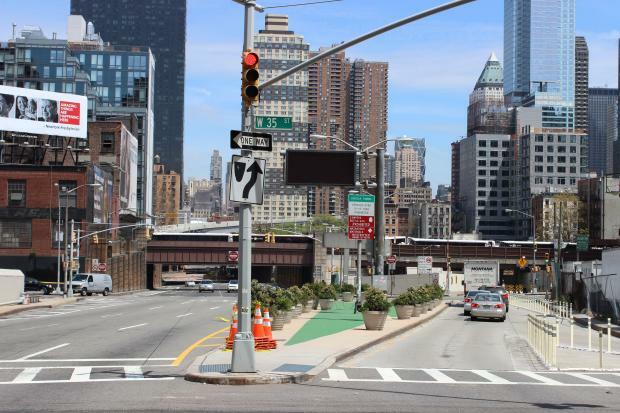 Locals hope the new plaza — a triangular strip on Dyer Avenue between West 35th and West 36th streets — will provide a piece of well-used public space, even though it's surrounded by traffic snaking its way to the Lincoln Tunnel. The park offers a stunning view of the Midtown skyline — even if it does smell a bit like car exhaust. The space, a former motorcycle parking strip, was reclaimed by city officials who towed away some of the remaining motorcycles, covered the street in new brickwork, painted it green and surrounded the plaza with potted plants. The conversion came at the urging of neighborhood groups, including the Hell's Kitchen Neighborhood Association and CHEKPEDS. The area will soon undergo a larger transformation into Dyer Avenue Park — which will include a strip on the east side of Dyer Avenue between West 34th and West 35th streets, expected to open in 2016, and a canoe-shaped section of West 36th Street between Ninth and Dyer Avenues, expected to open in June. CHEKPEDS has heard fewer complaints about honking in the area and lauded the park for its role in showing drivers that "they now have to share the space," according to a statement. While there was no one in the new park to enjoy the sunshine at lunchtime on Tuesday, officials hope the once-desolate area will soon come alive as the space becomes more popular.